No kitchen should be without this manual food processor. It is the most essential of all knives used in the kitchen. Slicing, mincing, dicing of all kind of food. Perfectly balanced, an extension of your hand. 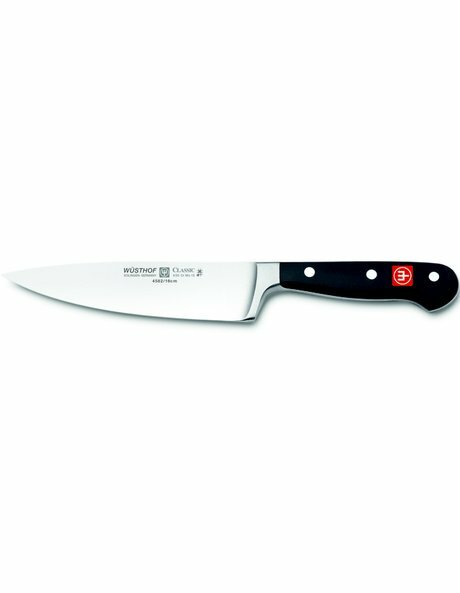 Precision forged from a single blank of steel with bolster and full tang. Ergonomic handle design developed in consultation with professional chefs. Full bolster/finger guard for safety and protection. Caution: Cook's knives purposely have been ground extra thin for the ultimate cutting performance. Chopping through bones will damage the fine edge.